What did my Pear Glace candle look like? Gorgeous!! The vessel is made of thick glass in a light green color… the rim is mottled and rough to further give it that vintage appearance. The label on the candle was black and silver with the company emblem and scent name in the center. The wax color was a light green with one centered wick. First sniff… I smelled a sweet and delicious pear… it was tart and fruity and definitely my kind of scent. Best of all… it didn’t smell perfumy like some Pear Glace fragrances I’ve tried in the past can be. This candle… sweet, fruity and delicious. Since this was a fairly good size candle, I started burning it in a large bedroom but realized within a few hours, I needed to move it to a smaller room. This candle was pretty lightly scented. Once I moved it to a small bathroom… it performed perfect and filled the room with a nice and steady soft fragrance…a sweet and ripe pear. Want to add… I know the packaging said these candles are made with essential oils but it was really hard to tell if that was true. Candles fragranced with essential oils are really distinctive and smell almost organic and natural. I wasn’t picking that up with this one. Strength – one a scale of 1 to 10, I would rate this candle a 4. It was pretty lightly scented. This candle started out great and then about half way down struggled a bit to maintain a full melt pool as it burned. It wasn’t that big of an issue as it still burned okay… there was just a little bit of wax along the glass wall that didn’t melt. I enjoyed this candle, I just wish it would have been stronger. It was a beautiful candle to watch burn and the fragrance was a nice and sweet pear scent… just very-very soft. Would I purchase it again given the chance? Yes. You can’t beat the price for the gift set it came in and it would make a pretty accent piece or a lovely candle to burn when guests are over. I purchased this gift set at Costco so check it out next time you’re there… you may walk away with one like I did. 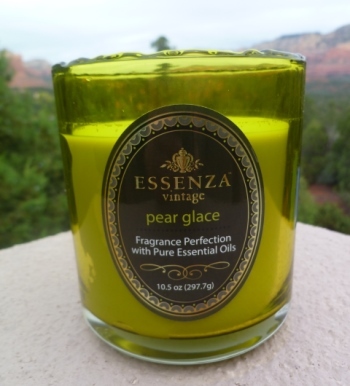 Have you tried Pear Glace from Essenze Vintage? Review with this us. It’s easy. Write your review and star rate your experience in the comment section below. Essenza Vintage candles came in a three pack gift set and was purchased at Costco. Pear Glace smelled sweet and fruity. 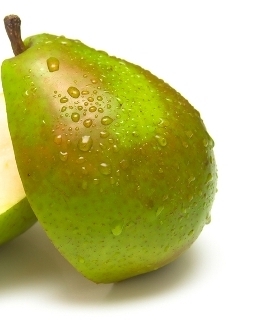 A perfect tart and sweet pear fragrance.